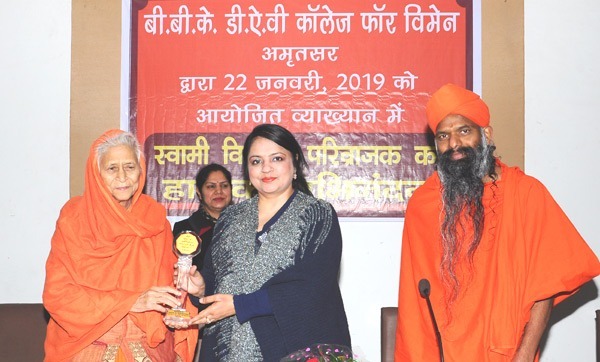 BBK DAV College for Women, Amritsar organised an edifying discourse by Swami Vishvang Privrajak, Darshanacharya from Darshan Yog College, Rojad, Gujarat. Present with him, on this occasion, was Swami Madhuranand also. At the outset, Principal Pushpinder Walia welcomed the guests with bouquets and souvenirs. Expressing her thanks to them, she termed the visit of Swami ji as a great blessing of God, an opportunity to charge our spirits. She added that spiritual enlightenment has to be an integral part of our overall grooming. Swami ji, in his highly electrifying lecture focused on ‘the art of living’ Differentiating between information and knowledge, he elucidated how weeding out of all blemishes at physical, mental and spiritual level through patience & perseverance is a pre-requisite for our life. He stressed upon the need of turning information into knowledge and then internalizing it. Answering the queries of students, he defined meditation as a procedure for visualizing the invisible. Dr. Anita Narender proposed the vote of thanks. Faculty members who benefitted from the discourse included Dr. Renu Vashisht, Prof. Anu, Prof. Jaspreet Bedi, Prof. Manpreet Kaur and Dr. Gauri Chawla in addition to college students.